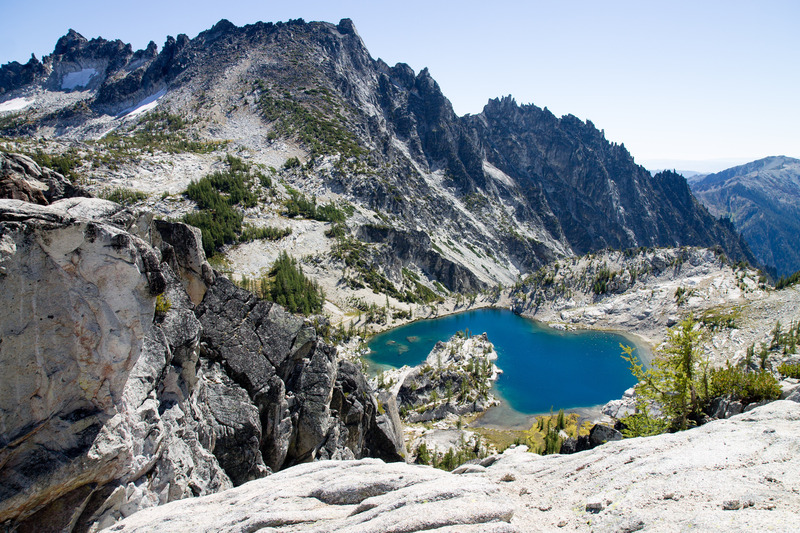 The Enchantments. The name holds an aura of glittering mystery and the hurdles to access them add to the impression. I’d heard whispers of them, always conflating their beauty and the luck of the permit draw. But on Labor Day weekend, my friend and I smashed away the perception of unattainability. 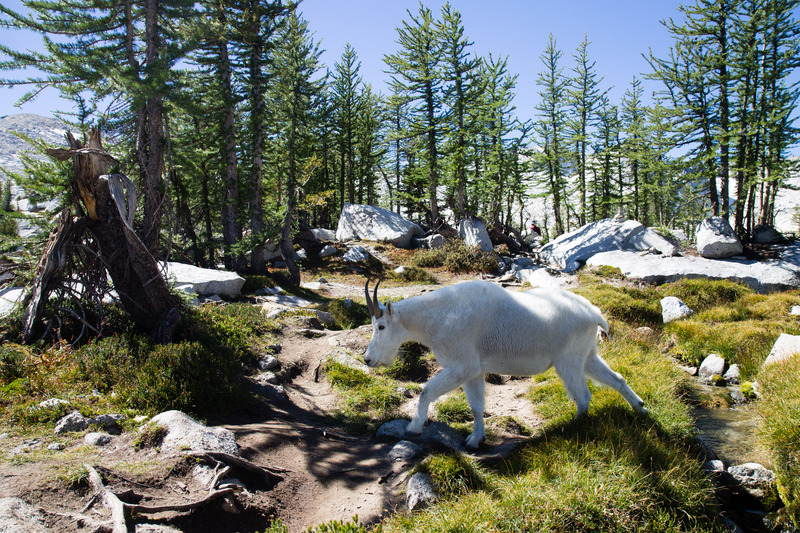 To camp in the Enchantments you need a permit, and to get a permit, you either have to get lucky in the permit lottery or try your hand very early morning at the ranger station. 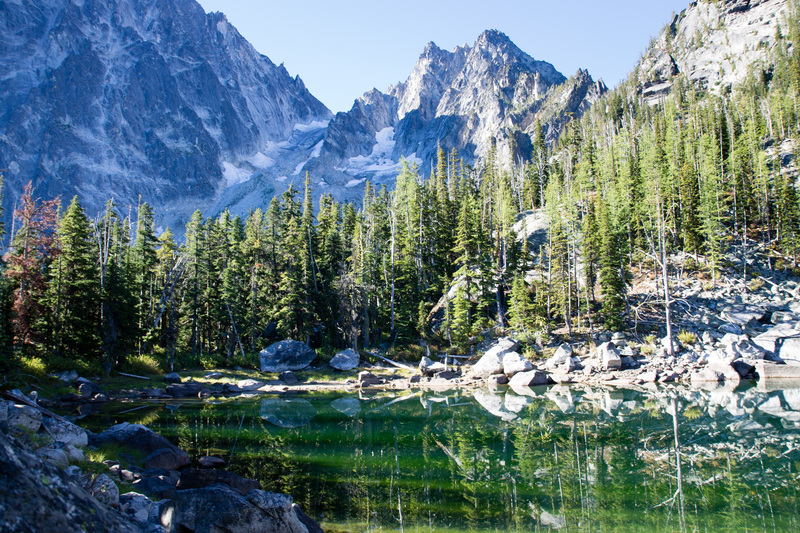 The Enchantments, a series of lakes in the Central Cascades, are a fragile alpine wilderness and it’s quite fair to limit the number of people pitching tents up there. 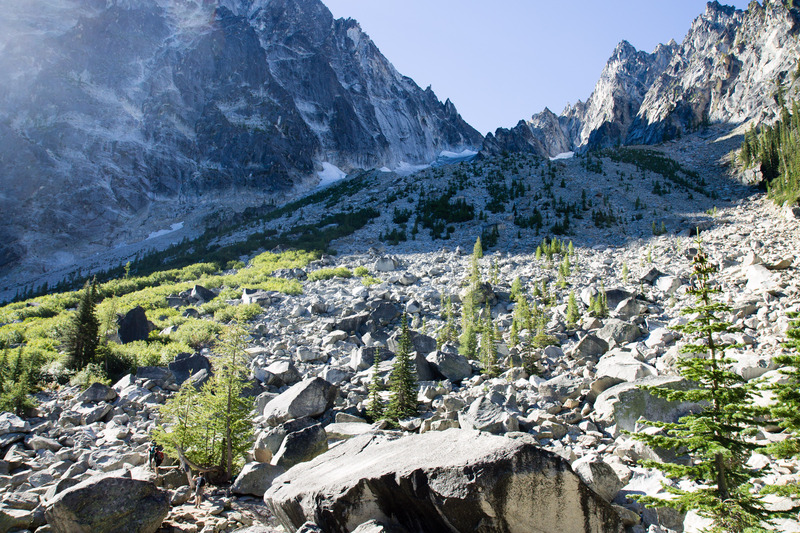 This also meant that I didn’t think I could get to the Enchantments anytime soon. 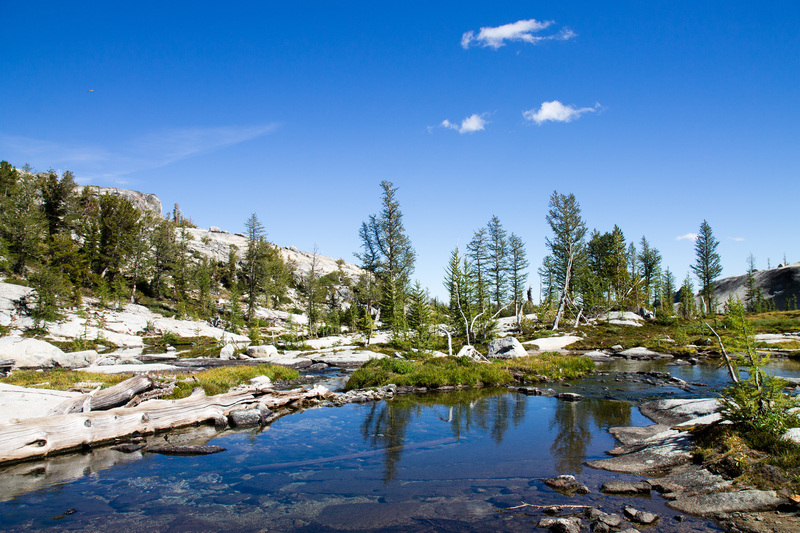 That is, until a couple days before my friend, Sierra, and I had planned to do some adventure, undecided as to exactly what, and she came back with the idea of the Enchantments. The permit is for camping. If you make it through in a day, you can go anytime. The hustle of spontaneous decisions ensued. We got the last couple of seats on a shuttle from the Snow Lakes trailhead to the Stuart Lake trailhead; since the hike is point-to-point, we were thus able to leave our car at the first place and start our trip at the second. After arriving in Leavenworth midday, we luckily found a campsite a few minutes’ drive from the Snow Lakes trailhead so we could meet the shuttle early next morning. And with that, we got ready for the day ahead. I was nervous. I’m a runner, but I have done very little trail running, which is what we were planning on. 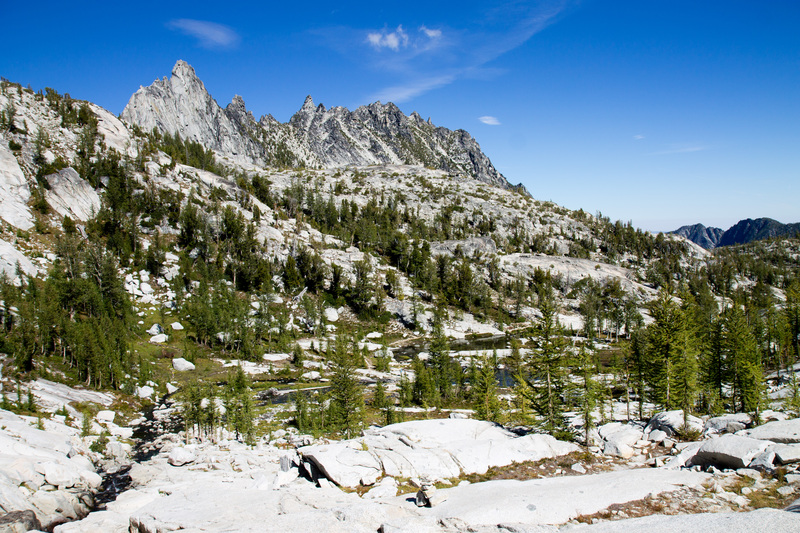 The Enchantments have quite a bit of elevation gain and the total hike is about 20 miles. Before heading into our tent, we sat at our picnic table and I munched through popcorn, partly for the carbs and partly for comfort. Our alarm went off in the morning, we shuffled around, packed up, ate some bars for breakfast, and made it to the shuttle with a little time to spare. The others in the van with us were through-hikers and trail runners as well. We chatted amongst ourselves and with the driver as he delivered us to the Stuart Lake trailhead. 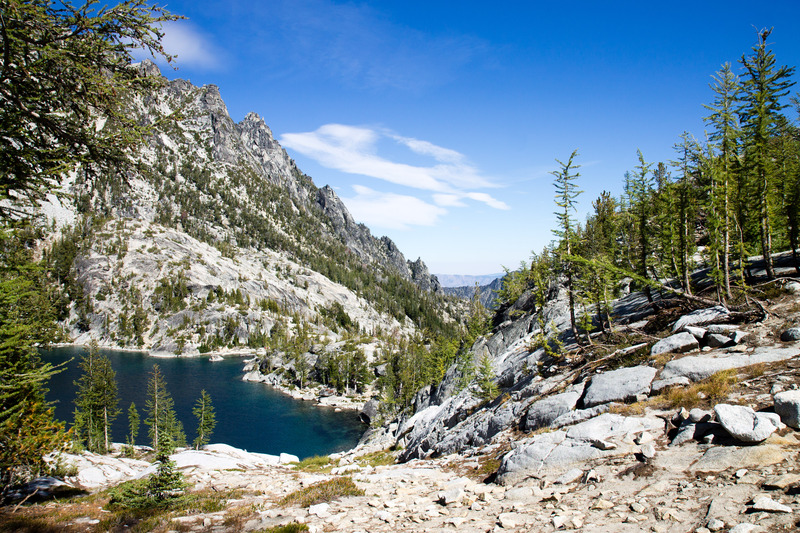 From there, Sierra and I began jogging up through the forest to Colchuck Lake. At an early viewpoint, while I took photos on my camera that I insisted on lugging around, Sierra chatted with a father who had apparently had to spend an unplanned night on the route with his two sons. 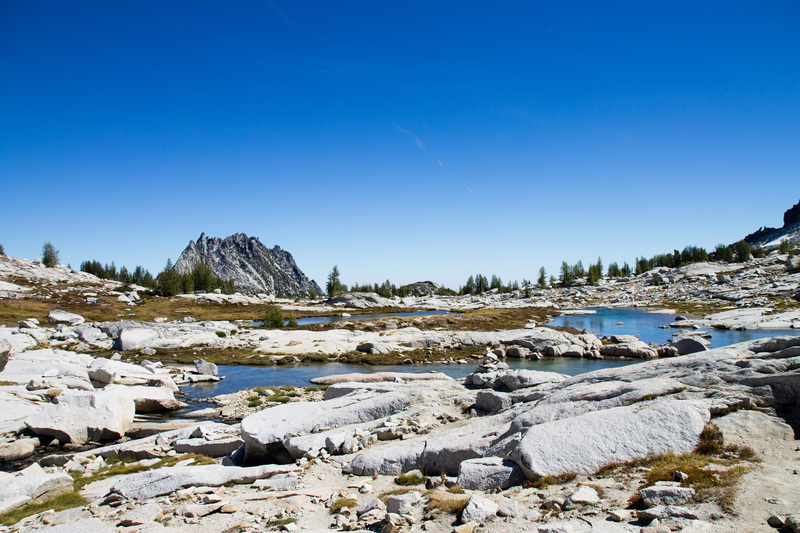 So, before anyone makes any plans know this: hiking the Enchantments in one day is hard. It is a lot of distance, and a significant amount of elevation gain. Sierra and I ran large chunks of the route (counterbalancing all of the stops I made for photos) and we still didn’t finish very long before dark. Sierra is a very experienced trail runner and I was in top shape, having recently run a marathon and biked from Seattle to Portland. I found the Enchantments very tough. My legs ached at the end. 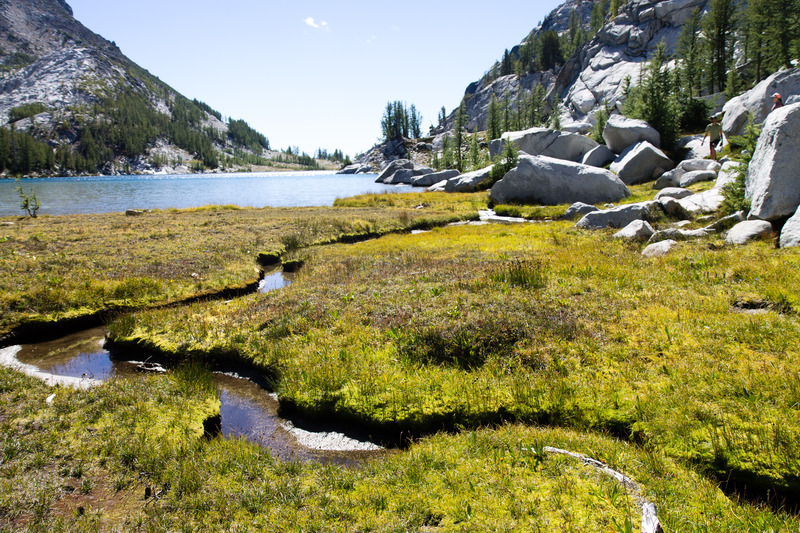 If you’re not an experienced hiker in really excellent shape, try for a permit instead. Spending more time up there would be lovely, anyway! Colchuck Lake put big grins on our faces. The morning light was bright and the lake hovered before us, dark blue beneath grey cliffs. 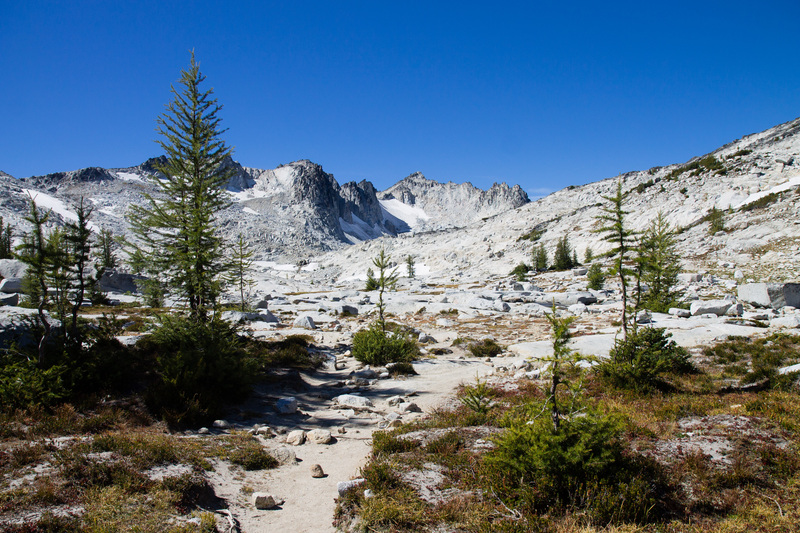 We rounded it, scrambling over some rocks, and then saw our next move: up Aasgard Pass. 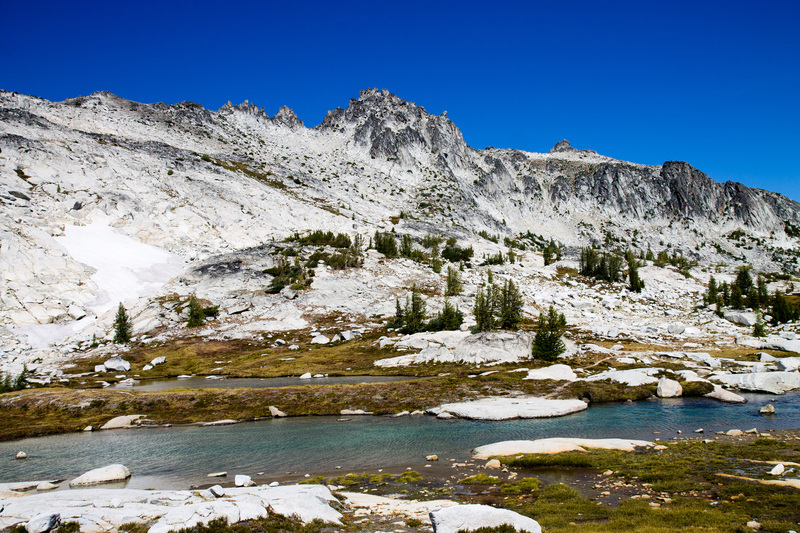 Aasgard Pass is an ascent of over 1,900 feet in a mile over not entirely stable rocks. 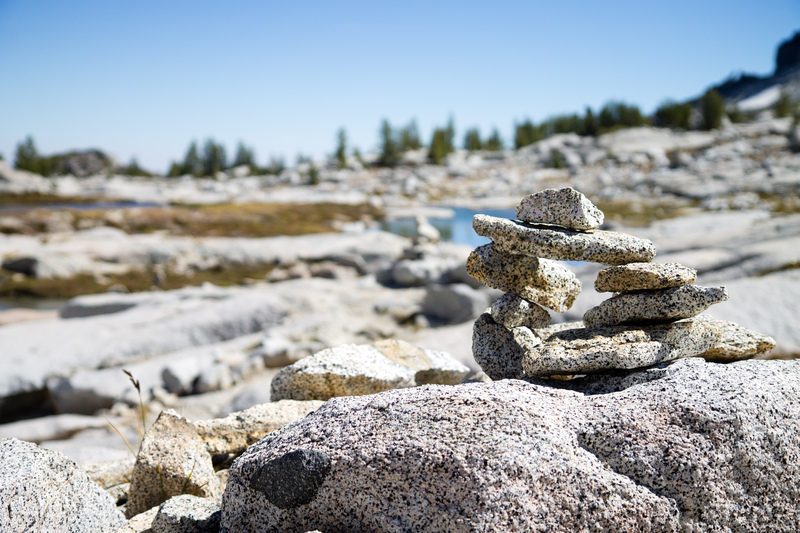 People have stacked cairns to mark the path, which would otherwise be quite impossible to pick out, but with the sun shining over the ridge, seemingly right into my eyes, it was still not easy to wayfind. However, there was a trickle of people before me who I could follow. At first, I excitedly pulled myself up—and got even more excited when I saw my first mountain goats and pikas of the day. But, as I got higher and the rocks felt looser, I started getting fearful. Shaking slightly and trying not to freeze up, I slowed down and inched my way to the top. 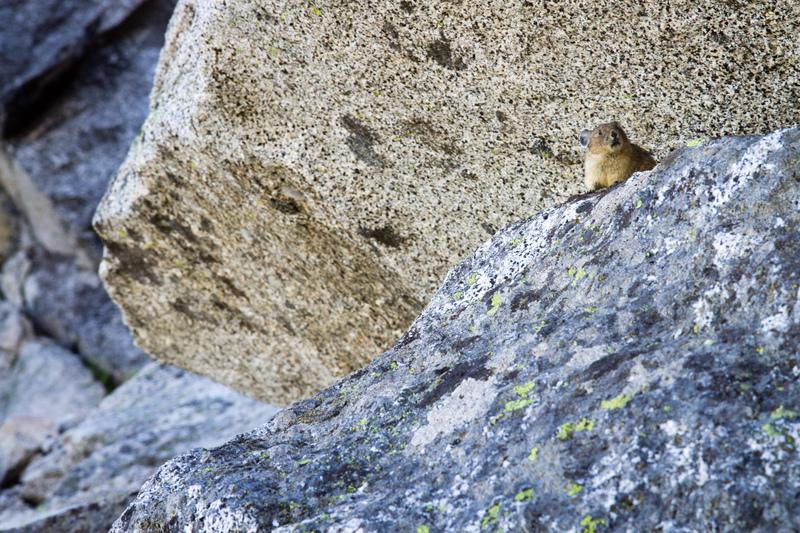 Cute little pika on the way up Aasgard. And there we were. In the Core. 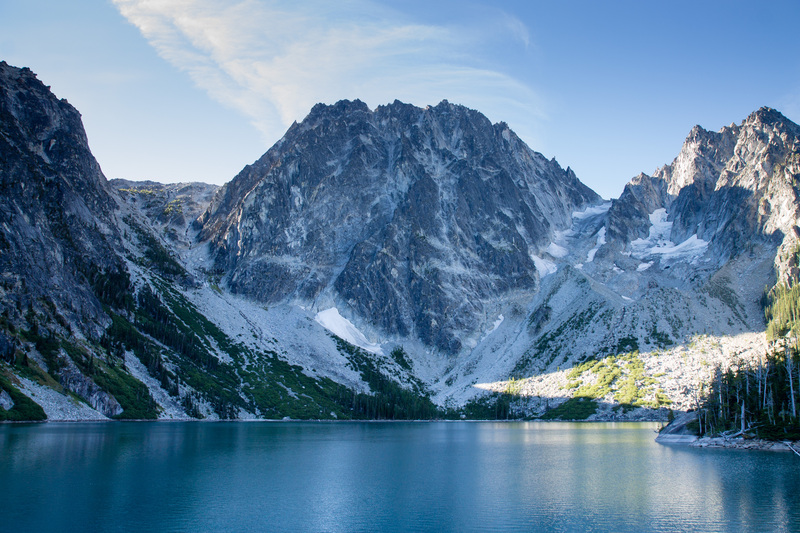 We looked down at Colchuck, now a deep blue puddle in the distance, and then turned to face a deep blue pool, literally sparkling in the sunlight, surrounded by white rock. 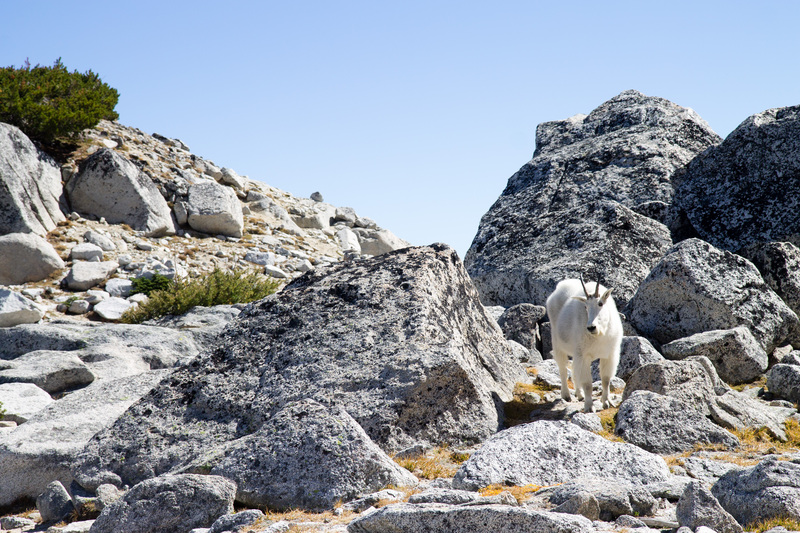 Sierra and I took a break to eat and take photos, and some mountain goats wandered by. Once we started trotting again, we realized we wouldn’t really be able to run the Core area, despite it being a runnable elevation profile again, because it was simply too beautiful to rush through. Pool after lake after pool, flanked by larches, white stone, and patches of snow. Every body of water we passed was deeply colored. New sharp peaks arose on the horizon as we made our way further along. More mountain goats wandered by. It was so bright, and harsh and delicate, that I could just laugh in wonder. We took our time through the Core, though that didn’t stop us from missing, or being misled, by a cairn and having to backtrack. Since it’s so rocky, there are stretches where there’s not an easy trail to pick out. Once, we found ourselves at a cliff we backed away from—too steep for sure—and after re-tracking, found the correct path, marked by a different cairn, which was also steep but at least had rods bolted into the rock that shoes could grip. The descent, though not as steep as Aasgard, is long and not without its tricky sections. 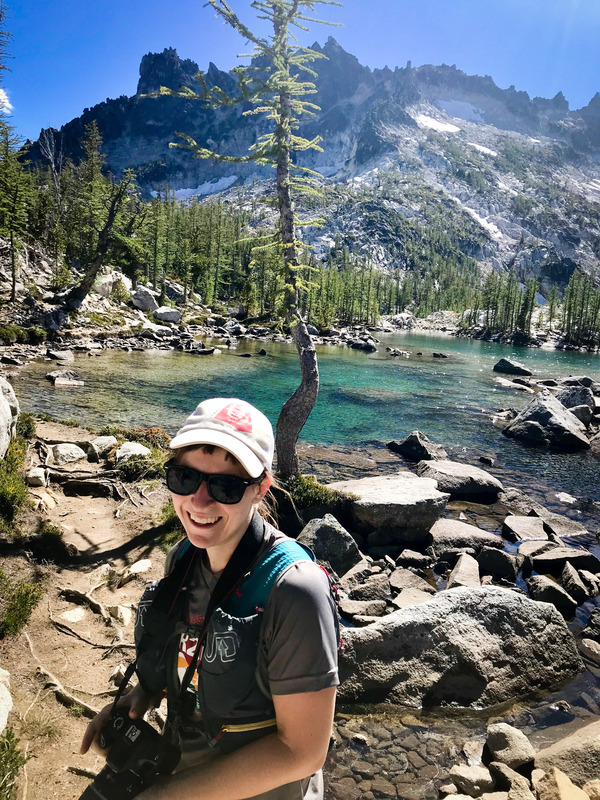 We reached the forest, passed Snow Lakes, and from there it was through the woods, past a roaring waterfall that seemed to be spit out from the cliff, and then a series of switchbacks to the trailhead. At this point my legs were aching with each impact and I was fantasizing about the butternut squash enchiladas I was going to eat in Leavenworth when we finished. The miles jogging downhill were punishing, but that’s the price of getting to the Enchantments. We finished dirty and hungry, but we did it. After scarfing down those enchiladas and able to think about something other than food, I was able to let the excitement and sense of accomplishment wash over me. And as much as I would dread Aasgard Pass, I would do it again, perhaps in larch season next time. Check out my Instagram story for more fun and images. Wow. These photos are gorgeous. Would love to see that part of the world. What beautiful photos! How lucky to have visited such a pristine place on earth! Thanks so much! I hope you can too one day.